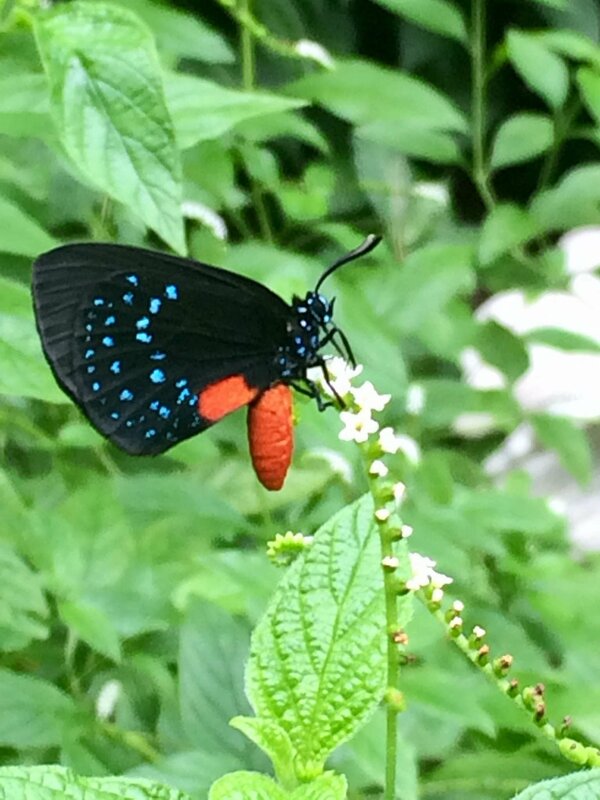 The beautiful Atala butterfly is a rare and threatened jewel of a butterfly species in South Florida and, if you have a garden, you can help make them a common sight once again. Keep reading to learn the simple steps you need to take to help in this effort. 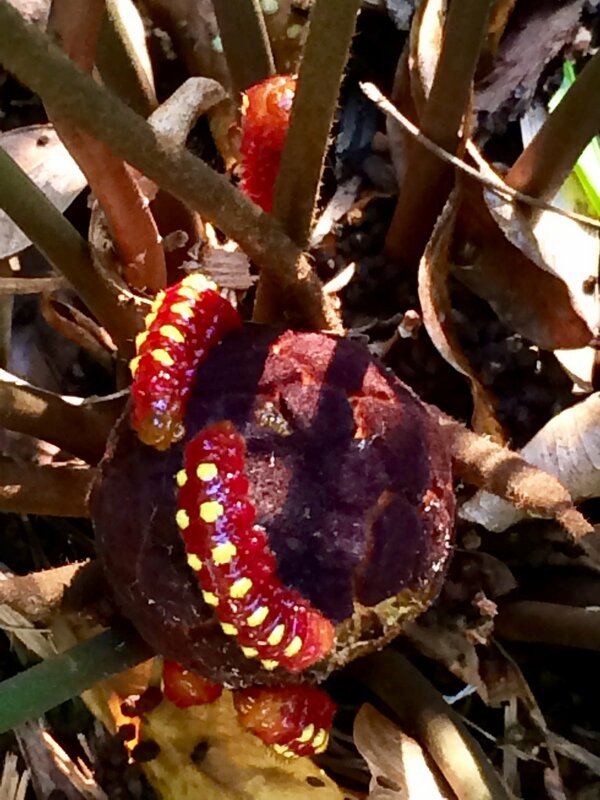 With nectar plants squared away, all that’s left is the coontie, the endangered host plant where the female Atala butterfly deposits her eggs so the caterpillars can eat the leaves. You can read more about its specifications here, and its interesting history, below. 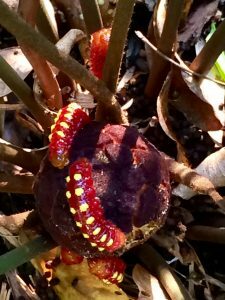 Expert opinions vary on how many coontie you need to plant to have a sustainable population of Atalas, but I would recommend you start with a minimum of four plants that are approximately two feet tall, as coontie grow and regenerate slowly. You can locate these plants by searching this database of native nurseries, or you can look closer to home, as Howard Tonkin of Urban Habitat recently opened a native plant nursery at Miami Ironside. He sells coontie with caterpillars attached, but do be sure you will have enough extra coontie to ensure the caterpillars can eat their fill. Howard can also steer you toward other nectar plants for the Atala butterfly which he sells Saturday mornings at the Upper Eastside Farmers’ Market at the American Legion Park. Otherwise, take a photo of the postcard below, which you can keep on your smartphone to have handy whenever you happen to pass by a nursery. Coontie is an ancient plant that survived the age of dinosaurs, but it almost proved to be no match for unthinking human beings. The name “coontie” comes from a Seminole phrase meaning white bread or white root. The Seminoles and other Native Americans in the area knew how to process the root to remove the neurotoxin, and early settlers followed their lead and began commercial production of the starchy residue which became known as Florida arrowroot. In fact, Florida arrowroot was the Miami River’s biggest industry for a time. However, the hurricane of 1926 put an end to the production of this starch when it wiped out the last arrowroot warehouse, and then the coontie itself was wiped out throughout the region because humans no longer found it useful. Luckily, a small colony survived the thoughtless destruction of its habitat and host plant, and the Atala butterfly and its host plant are being brought back from the brink. Please join us in this important and gratifying effort. 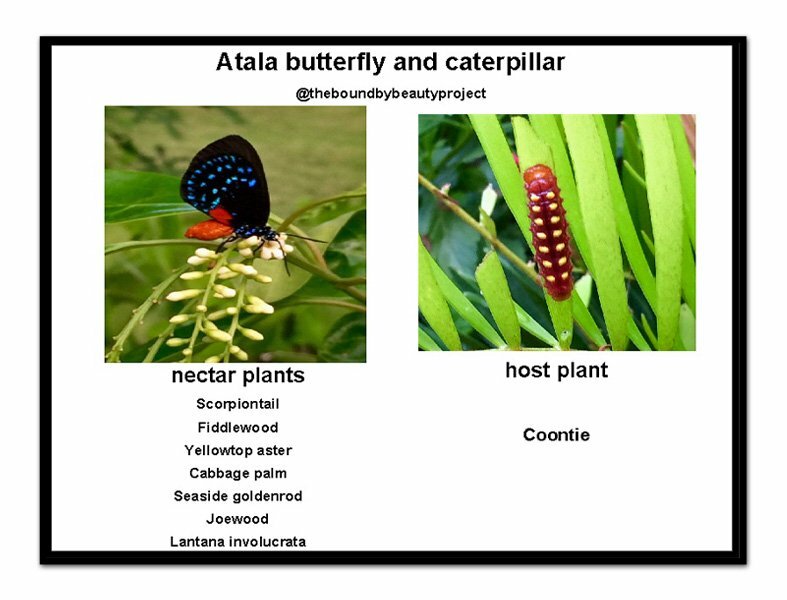 Atala butterfly nectar and host plants at-a-glance. How wonderful. 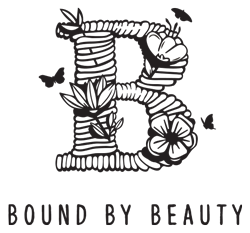 Thank you for being part of such an important endeavor.